The Badger is a wearable screen in form of a pinned badge designed to display images, gifs, or social media handles . It offers users a new way to express themselves by featuring virtually a limitless amount of images, symbols, or hashtags to choose from. A wearable device that allows you to dress, earn and impress. Get the latest updates, give us suggestions, and be first to know when the latest updates arrive. The Badger is an exciting combination of an open display and iconic fashion accessory, the pinned badge. Those who want to communicate directly with their surroundings wear descriptions on shirts, backpacks and other accessories. The Badger offers you the ability to make a style or business statement by allowing you to feature your favorite images, hashtags, or social media accounts. 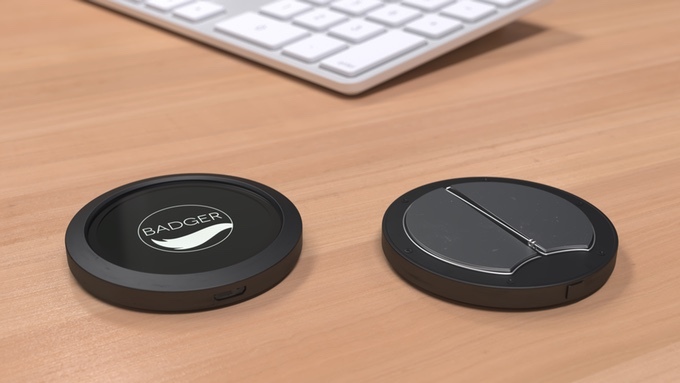 The Badger allows users to change the display's artwork through an app to better match your wardrobe. Express yourself in a new way, become a designer, make your fashion visible, add flair to your attire, and share your creations with the community. The device's display enables you to tell others about yourself without saying a word. It invites you to create a community whether you are shy or an extrovert. The Badger aspires to dress, express and impress. The Badger is a new fashion icon. It is your style shared with the world through messages, designs, and animations. This is your offline social network. Remove misinformation and confusion while avoiding delays and awkwardness at networking events. As you walk into the conference or convention, you will receive the Badger uploaded with all of your business contact information. You will no longer have to wait in line for your name tag and personal info during conferences. No more misinformation and confusion. No more frustrating delays when you network at events. The Badger replaces ugly lanyards, paper name tags, and boring business cards commonly seen at these venues. Along with your data, the Badger can show slides of your products, and even interact with others with similar interests. It is an exciting new tool to present yourself and market yourself. Saves time for conference attendees/speakers/organizers and money for the conference/hotel industry because it replaces name tags, advertisement pins, and bulky materials. So far everything we create or post online is generating profit for large companies. Why not reverse that? We are introducing a new, Personal Advertising Solution (PAS) as a feature within the Badger. The PAS will allow users to make money by advertising a campaign during social events and conferences, while making money from linking online activities to offline settings. Based on the interest of an advertiser, you will be offered opportunities to promote a cause or share a product with the Badger wearable acting as mediator during the process. This new approach offers you the chance to make money on the go. It was about time to empower users and make their activities profitable.